Last Monday the Binoche–Giquello auction house in Paris sold this sculpture for $4 million. 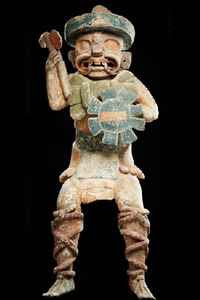 The Mexican Ministry of Foreign Affairs and the National Institute of Anthropology and History (INAH) have issued a joint statement declaring that the sculpture "was manufactured recently and in no way belongs to any of the Prehispanic Mexican cultures"! The apparent erosion was made to give it an antique appearance. INAH also criticizes the shoe laces, which look to me more Saxon than Mayan. That the $4m sculpture is a fake is bad news for one punter, but worse is to come. INAH experts reckon that of the 207 lots that were auctioned, 140 pieces are prehispanic and 67 were recently made (title link). So there is a thriving market in fake Maya artifacts.